Our Environment Centre is home to a range of animals which can range from stick insects and fish to turtles and guinea pigs. The care of these animals is done by the students with teacher supervision. Caring for the animals provides students with experiences in being confident and respectful in their care whilst having direct involvement in animal life cycles, behaviours and temperaments. Students also learn about cycles of food by using our school food waste to feed our chickens and worms. They are able to directly the benefits of our no waste approach through the eggs and fertiliser they provide. 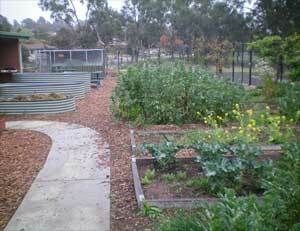 Our gardens are planted and sustained by our students and parents and are there for the use of our school community. We have a fabulous group of 'Monday Mums' who keep our gardens growing and weeded, ensuring that our crops are successful. 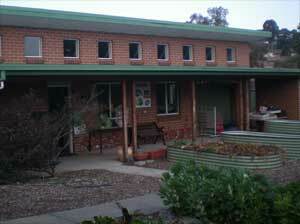 In 2014 our community raised funds to purchase a large green house which has extended our planting times. It has also allowed us to begin Spring crops early and provided us with the opportunity to grow seedlings to sell to parents, students and staff for use in their home gardens. 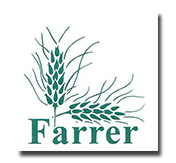 Farrer is also lucky to have people in our wider community to share their interests and expertise. This has involved having a range of visitors share their knowledge with our students. We have also had a Landcare volunteer take our students up on Farrer Ridge to help them understand our local environment and how to care for it. Our produce is eaten fresh from the gardens, or used in science, cooking and nutrition lessons. The students prepare and cook the food themselves, giving an understanding of hygienic handling of food and the science of cooking. Some of our produce is used by our school canteen. This provides nutritional options for our students, reduces costs for our canteen and exposes the students to a range of options for how to eat our produce. Our Year 6 students are given the option of taking on various roles in our school. One of those roles is as a Green Teamer. The Green Team are responsible for the maintenance of our gardens and animals. They visit the Environment Centre during their lunch times to do jobs such as cleaning the animal tanks, working in the gardens, picking and preparing produce for sale to the school community and sustaining our Waste Wise initiatives. They are also given the opportunity to participate in extra curricular programs such as Kids Teaching Kids. The Green Team are a very valued part of our school. Our Environment Centre is used as the focus of our chemistry and physics. Our school uses the Primary Connections programs to teach Kindergarten to Year 6 about energy and matter. Over the years our Environment Centre has collected a large range of equipment and tools to use in the teaching of these areas. The programs allow for students to follow areas of interest whilst learning about good scientific process. Carol Edwards, an entomologist, is our school's scientist in residence. Carol has been involved with our school for a number of years as a parent and scientist and is well respected by our students. She advises and organises our garden planting and pest eradication as well as specifically working with some of our year 6 students to give them real life experiences in science. Her background and passion for working with students provides our students with an invaluable opportunities to understand the real life applications of science. At Farrer our sustainability program involves students in understanding the processes of growing food in an organic way. We learn how to deal with pests, how to nourish our soil and how to promote strong plant growth. Our seasonal plantings help students to understand what it means to eat 'in season' food and why 'food miles' are important to consider. By participating in planting and cropping, our students are shown the value of fresh food and the work that goes into producing it. Students learn about and help care for the different animals in the Centre. Through this process they develop an understanding about the different habitats, the needs of each type of animal, how to maintain the habitats and things which impact on each habitat.